14.3" x 8.9" stitched on 14 count. 11.1" x 6.9" stitched on 18 count. 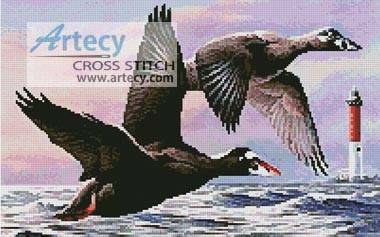 Surf Scoter Ducks cross stitch pattern... This counted cross stitch pattern is of two Surf Scoter Ducks flying over water with a lighthouse in the background. Original image courtesy of www.wpclipart.com. Only full cross stitches are used in this pattern.